Basic information on Touchi Extract effects. 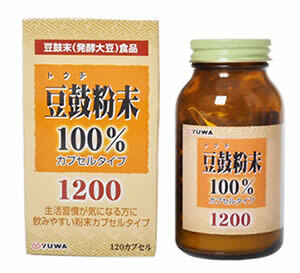 Touchi Extract is officially approved by the Ministry of Health of Japan (it is known for its strict standards) and received a special mark tokuho (Tokuho) confirming its effectiveness on state level. Official research took place back in 2001 and was published in the Journal of Healthy Nutrition number 131-1. Studies on the target groups made it possible to include this medicine in the list recommended by the Ministry of Health to maintain normal blood sugar levels. Japanese specialists of the manufacturer company confirmed that "Touchi extract" is the food product that effectively inhibits the absorption of sugar. The efficacy and safety of this product were convincingly proven by scientific researches, and its industrial production was successfully launched. Untill today, 23 patents on this medicine and its derivatives were received in Japan and abroad. Many articles have been published on the effects of Touchi extract- mainly in the Japanese magazine Japanese Journal of Complementary and Alternative Medicine. You can get acquainted with the medical research of Touchi Extract in more detail at this link in our blog. In contrast, in an environment with a low content of alpha-glucosidase, the absorption of sugar is slow, and the level of sugar in the blood rises just as slowly. People with high blood sugar levels need to slow down the process of sugar absorption as much as possible. The role of an inhibitor, inhibiting the absorption of sugar, performs Touchi extract. When taken together with food, “Touchi extract”, the digestive enzyme alpha glucosidase is blocked and, as a result, the increase in blood sugar content after a meal is slowed down.